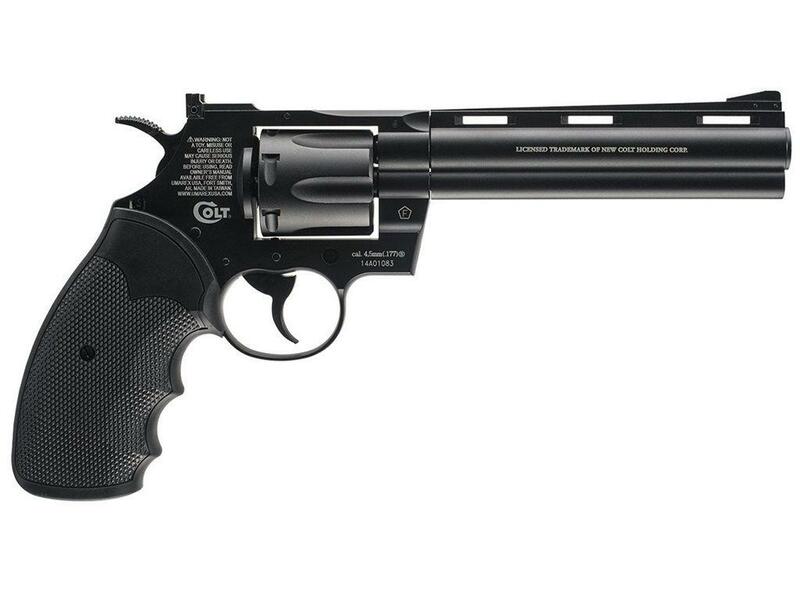 Umarex Colt Python 6-Inch BB Revolver | ReplicaAirguns.ca | Easter Weekend Sale! 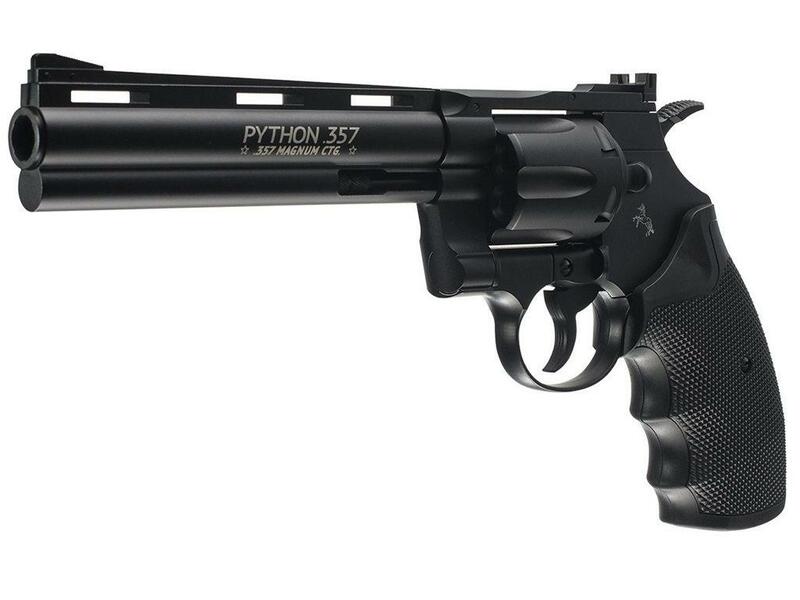 Trigger Pull: The trigger pull on the Colt Python 357 CO2 BB Revolver is good in both single and double action and even better than the Dan Wesson and S&W 327 TRR8 shell loading revolvers most likely because the spring tension that pushes the inner barrel to make contact with the cylinder is noticeably lighter. Even the hammer is smoother and has less wiggle with a better trigger and hammer mechanism overall. Accuracy: The results I got shooting my 6 round group from a 30 foot out semi-rested position were good overall. Vertically, there was about a 2 inch spread while horizontally there was about a 1 inch spread. I did find that the plastic tips on the brass shells seemed to be a bit tight at first and this is when I did most of my Chronograph and target shooting. I believe the tightness affected the consistency of the FPS which also affected the accuracy especially up and down. I did get one shot out of the Umarex Colt Python 357 well over the claimed 400 fps but again the fps was rather erratic most likely because of the snug BB fit due to shell break-in. Build Quality: The Umarex Colt Python 357 being mostly metal, you would expect it to have a decent build quality and I am happy to say it does, perhaps again even better than the Dan Wesson and S&W 327 TRR8 shell loading revolvers. Even the weight of the Colt Python came in close to a half of a pound more! The only real plastic I could find was in the grips and the shell tips. Fit and finish was also good with no noticeable paint wear or sloppy workmanship. 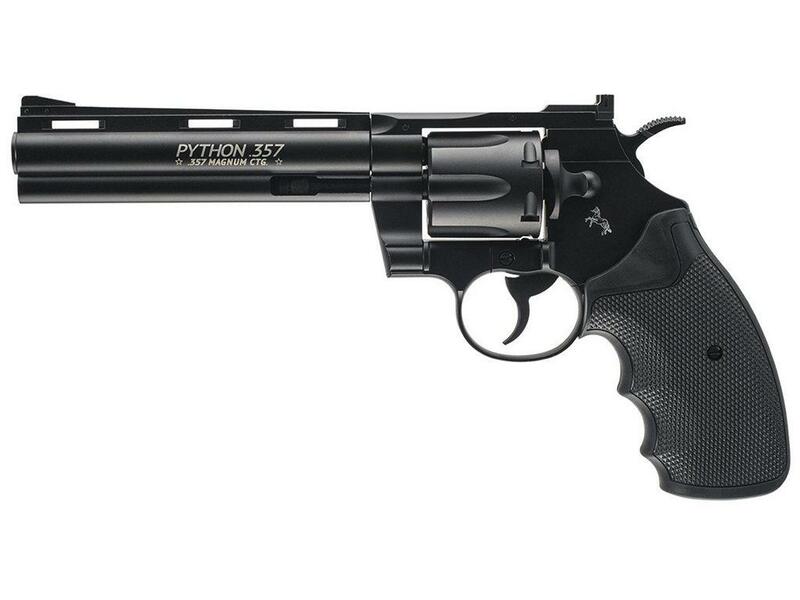 Realism: The Colt Python 357 CO2 BB Revolver overall is a close copy of the real steel Colt Python 357. I did notice the rear portion of the receiver (between the rear cylinder and hammer) to be a bit longer perhaps to accommodate the CO2 valve length, but other than that this pistol is super close to the original revolver it is based and licensed on. Again being all metal gives this CO2 BB revolver very realistic weight and feel and the loadable brass shells make using this gun almost exactly like using a real shell loading revolver but for much less cost per shot and of course a lot less recoil on the hands. It's a revolver with actual shells! Give you the feeling of loading and shooting a real revolver. Lots of detail, well made, fit and finish is very good. Good overall weight, heaviest out of all the shell loaders. Good overall power, accuracy and shots per CO2. Fully adjustable sights for windage and elevation. Nice easy Trigger pull in both single and double action. Grips are a bit rough. My son bought this to compete with my DW 8". Perfect match! Great gun! Great price. But my 8" DW is meaner looking! LOL!!! I like the gun generally, it feels and looks like the real thing, I am not really impressed by the uncomfortable grips but that I can overlook. My worry is that the cylinder is very wobbly and seems rather loose, I would like to know if that is a common trait with this particular model or did I just get a dud, if I did get a dud is there some way of tightening the cylinder up myself? Always fun when a revolver is involved and the Python does NOT disappoint! Well designed and quality crafted leave you feeling power in your hand...A good kick when fired and surprisingly accurate leaves me not wanting to put it down...love the realistic she'll bb holders, a real nice touch! 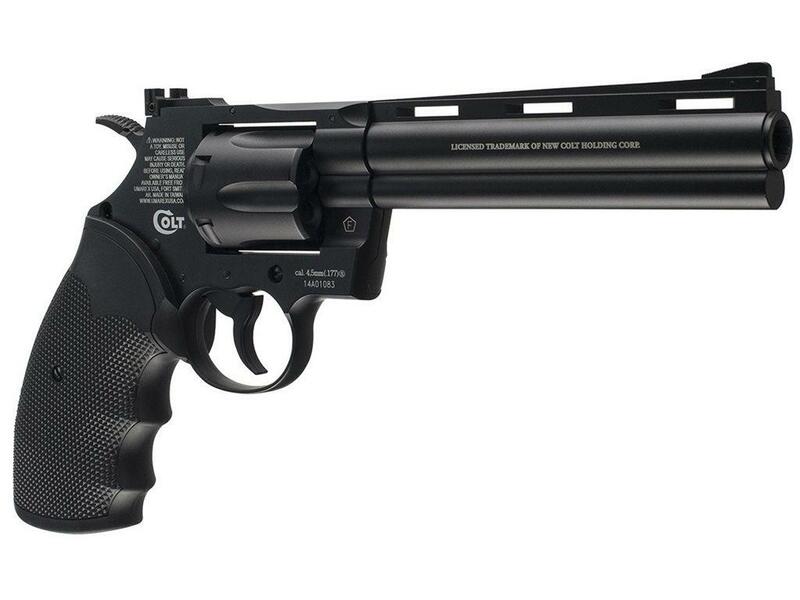 http://www.ReplicaAirguns.com - Umarex Colt Python 357 CO2 BB Revolver Table Top Review. 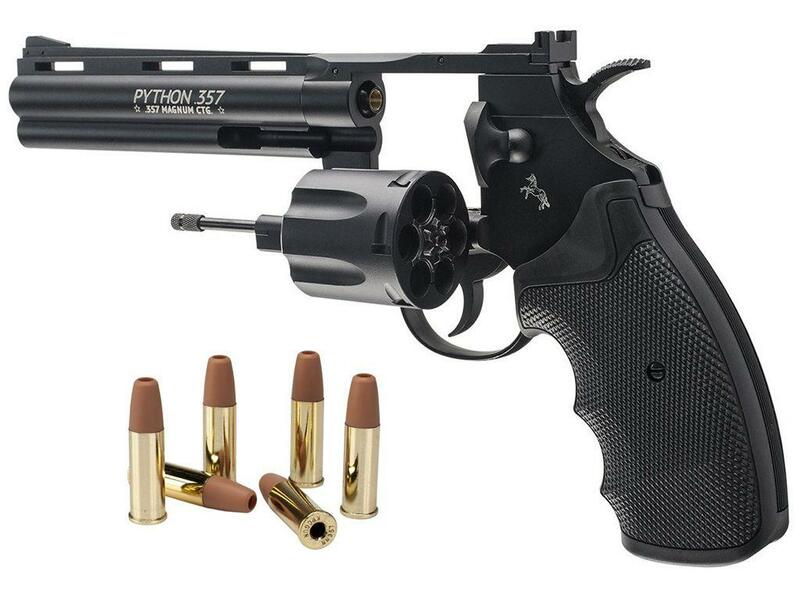 This is a table top and shooting review combined of the Umarex Colt Python 357 CO2 BB Revolver. I show you around this BB revolver and walk you through its basic operation and handling. I also did a pre-test for the Umarex Colt Python out with my Chrony Chronograph to see what the real world fps velocity actually is and I also shoot it from 30 feet out on a target to see how accurate this target pellet shooter is on a paper target.